Kibbeh is an essential dish to lebanese cuisine. There are various different forms, and techniques used to make kibbeh. You can bake it, fry it, or grill it. Make it into balls, stuffed and baked, or crispy and flat. During my last trip to Lebanon I learned how to form the kibbeh balls. They look like footballs - I might not be an expert yet but I tried! 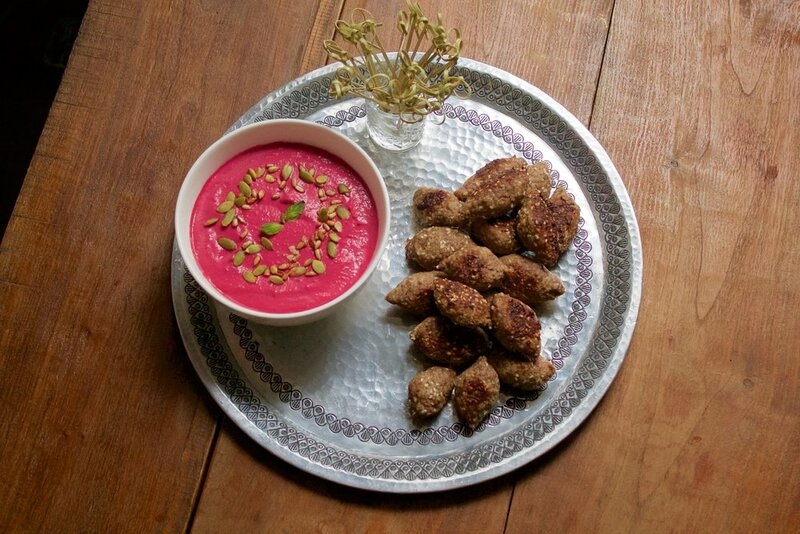 The beet yogurt steals the show - it is refreshing and delicious, complimenting kibbeh so well. Use it as a dip for your next mezze spread! In a medium size bowl, soak the bulgur with lukewarm water for 10 minutes. Place the onion and 1 tbsp of buharat in a food processor and pulse for 60-90 seconds or until well-minced. In a large bowl mix the ground beef and ground lamb with the onion mixture, the remainder of the buharat, salt, drained bulgur, and sesame seeds. Mix well and until fully combined. Drizzle olive oil on a sheet tray and form footballs with the meat mixture, by pinching the ends. Put the finished, football-shaped mixture on the sheet tray. 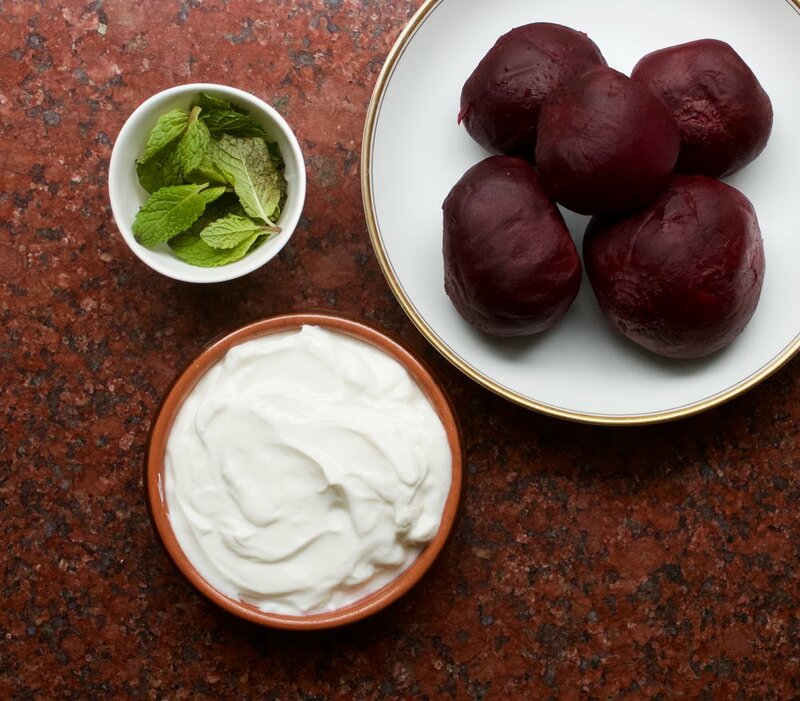 Serve with the beet yogurt dip. In one easy step, add all the ingredients into a food processor and mix well until well combined! Taste for salt – and adjust seasoning. The traditional and best way to start your morning in the Middle East is with a man'oushe in hand. A man'oushe is a flatbread that is normally made with zaatar, and finished with fresh veggies rolled up and eaten like a sandwich. If you get it at the right place, fresh out of the oven - it is to die for. Crunchy, simple and delicious. I decided to make this breakfast essential into a mini hors d'oeuvre to add to my spring menu! With different toppings and sauces this can be catered for any event or client! The dough recipe is from David Lebovitz' website !! 1. 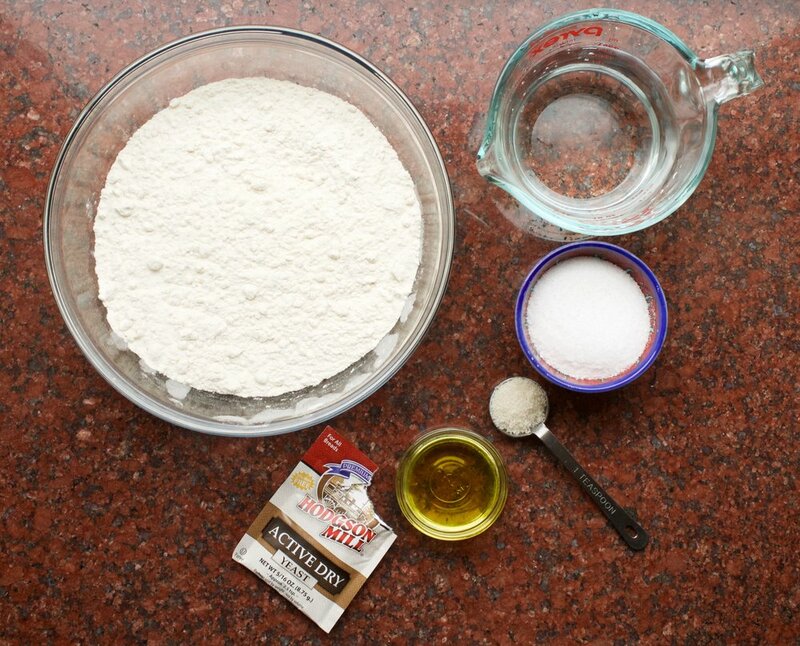 In a stand mixer bowl, activate the yeast by sprinkling it over the water along with the sugar. Let sit in a warm place until the yeast starts to bubble, about 10 minutes. 2. Using a dough hook attachment, stir in the olive oil, flour and salt. Mix on medium-high speed for 5 minutes - until the dough becomes a smooth ball, but is sticky when touched by your finger. The dough should start pulling off the edges of the mixing bowl. 3. Cover the dough in the bowl with a kitchen towel, and let it rise in a warm place until the dough has doubled in volume - about 1.5 hours. 4. When the dough has doubled in volume, roll it out onto a lightly floured countertop, and divide the dough into 4 pieces. 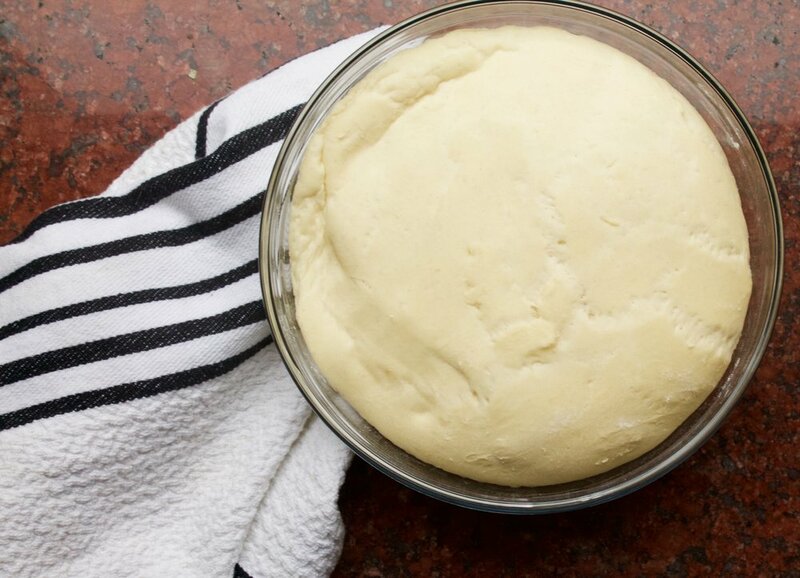 Roll each piece of dough out, until the dough starts to resist. Cut the dough into small circles with a circle cutter. Then roll again to stretch the mini circles. 1. When ready - preheat the oven to 450F. 2. Line a sheet tray with parchment paper, drizzle with olive oil, and start lining up the man'oushe circles the parchment paper. 4. 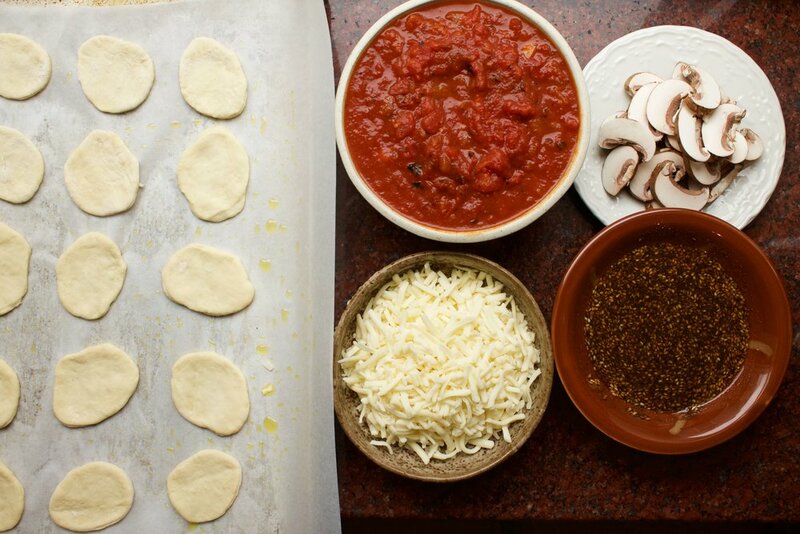 Spread the za'atar mixture on half of the man'oushe circles, and spread tomato sauce on the other half. 5. 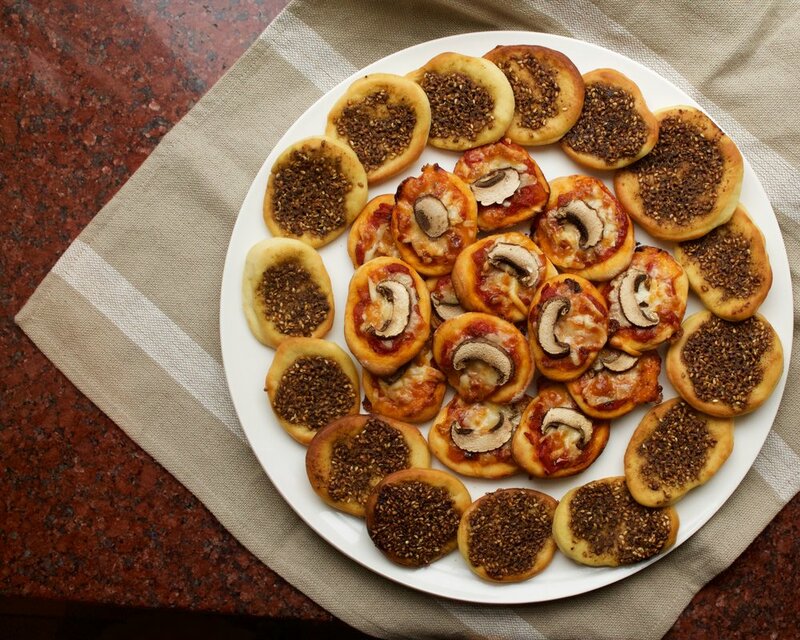 Finish the pizza man'oushe with a little cheese, and a slice of mushroom. 6. Bake the man'oushe for 5-7 minutes or until golden, and crispy. 7. Serve warm, or cool down and freeze for later use. In high school I participated in a german exchange program. My host mother showed me a whole new side to modern housewife. Every morning the fresh bread was delivered, and the table was set for a feast. Eggs, sausage, sliced salamis, cheese, fruit! Everything you could ask for. One day she made something different - Pfannkuchen - with fresh, and cooked berries, freshly whipped cream, and mint. That is when I fell in love! All the ingridients are in your fridge - so go make it and fall in love! Preheat oven to 450F degrees. In a blender combine flour, eggs, milk, honey, vanilla extract, and a pinch of salt. Blend together until combined, and foamy about 90 seconds. In a large cast iron skillet, or nonstick casserole - melt butter, and pour batter. Bake until the cake is golden and puffy, about 18-20 minutes. DO NOT OPEN THE OVEN! Finish off with honey and a fresh squeeze of lemon. Slice and dig in <-- right away! You can serve this with any seasonal fruit, berry, or do a plot twist and throw some sunny side eggs and bacon on there! Sometimes basic is good, you can use this granola on anything, salads, parfait, crumbles! It adds a crunch to your day! 2. In a large bowl, mix the oats, nuts, seeds, brown sugar, cinnamon, and salt. 3. In a small bowl, whisk the maple syrup, honey, and melted butter together. 4. Drizzle the wet ingredients over the dry ingredients. 6. Line a large cookie sheet with parchment paper, drizzle olive oil. 7. Spread the granola mixture on the cookie sheet, bake for 35-45 minutes, by checking and stirring the granola every 15 minutes. 8. Pull the granola out of the oven when it's brown and crunchy. 9. While it's still warm, stir in the dried fruit. 10. Let it cool down, and become crispy! 11. You can eat this granola as is, jar it up for the week, and use it on anything from parfait, to salad, or even chicken salad sandwiches. 1. Assemble the parfait by starting off with the Greek yogurt, topping it off with granola, and citrus. 2. Eat up, and stop being hangry!